Few recent films deserve to be called poetic. A Midnight Clear earns that description, though if the movie were actually a poem it would a couple of stanzas too long. 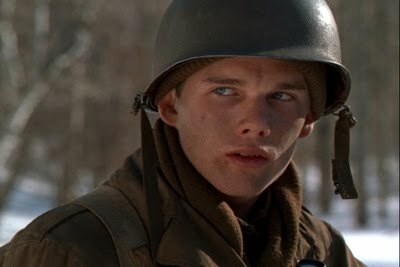 Ethan Hawke narrates as Will Knott, a young Army sergeant stationed with an intelligence unit near the border of France and Germany in World War II. Adapted by director Keith Gordon from William Wharton's novel, A Midnight Clear invokes an almost hypnotic presence as it invigorates the familiar film terrain of young men in battle. Knott and the five remaining members of his unit are, in many ways, stock characters, but the script and performers bring the young men to vivid life. In addition to Hawke, A Midnight Clear features the young actors Peter Berg, Kevin Dillon, Frank Whaley, Arye Gross and Gary Sinise. All do well playing men who find a sliver of hope in a dreadful situation. What makes the film's portrayal of youth at war so refreshing is that not only are the American soldiers uncertain of their European purpose, so are the German troops they encounter while on reconnaissance. It's Christmas 1944 and the men are sent by their major (John C. McGinley, whose overplaying of the requisite jerk officer is the film's weakest element) to an abandoned house to search for a lost patrol, who were presumably captured or killed by German troops. Once there, besides enjoying comparatively luxurious housing, they also discover the nearby presence of several German soldiers, who at first seem to be taunting them but soon reveal other purposes. The film produces many startling images such as corpses in the frozen woods, a forest where one can never be certain where a sound is coming from. Even Hawke's voiceover narration ends up being an above-average example of this overused technique. The plot's developments, surprising even though the eventual outcome seems telegraphed, occur so clearly and so wonderfully that they inspire. The perfect mood and individual scenes mesmerize to such an extent that the structure seems too fragile to survive. If the film had ended 15 minutes sooner, the mood would have been preserved and A Midnight Clear would have been a perfect tone poem of a film. Unfortunately, the film goes on. McGinley returns in standard-issue scenes that don't deserve a place in this film and the unit's story continues, telling what happens to the men. Most of the ending scenes are good, but following the nearly flawless sequences that precede them, it lowers the film's entire worth. It could be argued that the ending scenes need to be there to avoid the feeling of unfinished business. That might be true, but the result drops what could be a truly great film to the realm of the merely good. Either way, Gordon creates a satisfying film experience which, flaws and all, succeeds at the uneasy task of being both hopeful and thoughtful.